October saw a focus on content and influencer marketing: Brandwatch purchased BuzzSumo; Ginzamarkets acquired Withfluence; and, iSentia exited content marketing to focus on its core business. Meanwhile, September ended with a late announcement from Nasdaq, AMEC launched a new measurement guide and FIBEP has a new president. At the end of September, Nasdaq announced that it was exploring “potential strategic alternatives” for its PR Solutions and Digital Media Services units. This process is a result of Nasdaq’s refined strategic direction, which “emphasizes the company allocating more resources towards technology, data and analytics opportunities”. According to the Financial Times, Nasdaq may sell, restructure or seek a partner for the units, which generated about $195m of revenue in the 12 months to June 30, or about 8 per cent of Nasdaq total revenue. Brandwatch has acquired BuzzSumo, a content marketing and influencer identification platform, for an undisclosed sum. According to Techcrunch, “the acquisition adds an important arrow into Brandwatch’s quiver, which raised a $33 million C-round war chest in 2015 for just such a move…. To date, BuzzSumo has provided data-driven content discovery and performance analytics to nearly 3,400 customers and more than 300,000 users worldwide, including Expedia, BuzzFeed and Disney. Brandwatch CEO Giles Palmer says the two companies will be run in parallel”. Brandwatch have also announced a couple of product innovations during October: an integration with Twitter Ads and a new Quick Search feature to allow users to quickly interrogate social media content and data. Brandwatch may want to pay some attention to iSentia’s content marketing story. The Australian company has announced that it will wind down its content marketing business, formerly known as King Content, by the end of the year. iSentia purchased King Content for $AUD48 million two years ago, which has faced continued reports of underperformance. In other news, iSentia has reached a settlement with Meltwater in proceedings we reported in June. The settlement is confidential. However, Meltwater, without admitting any further liability, has agreed to permanent orders to restrain them from engaging in conduct which was the subject of iSentia’s claims. iSentia also reported “soft” first quarter results for the 2017-18 financial year. The company’s revenue guidance is between $133 million and $138 million for FY18, down between 11 per cent and 14 per cent from FY17. EBITDA is expected to total between $32 million and $36 million for the current financial year, down 13 per cent to 23 per cent from FY17. The company is now restructuring its sales team to focus on customer retention and premium services. Sticking with content marketing, Ginzamarkets has acquired Withfluence for an undisclosed amount. Ginzamarkets, a San Francisco ad tech company, operates an SEO and content marketing analytics service called GinzaMetrics and is looking to develop its business in Asia. Withfluence, the Tokyo-based influencer marketing group, also supports clients in South-East Asia via offices in Thailand, Vietnam and Singapore. Both companies have a strong focus on analytics within influencer marketing campaigns. 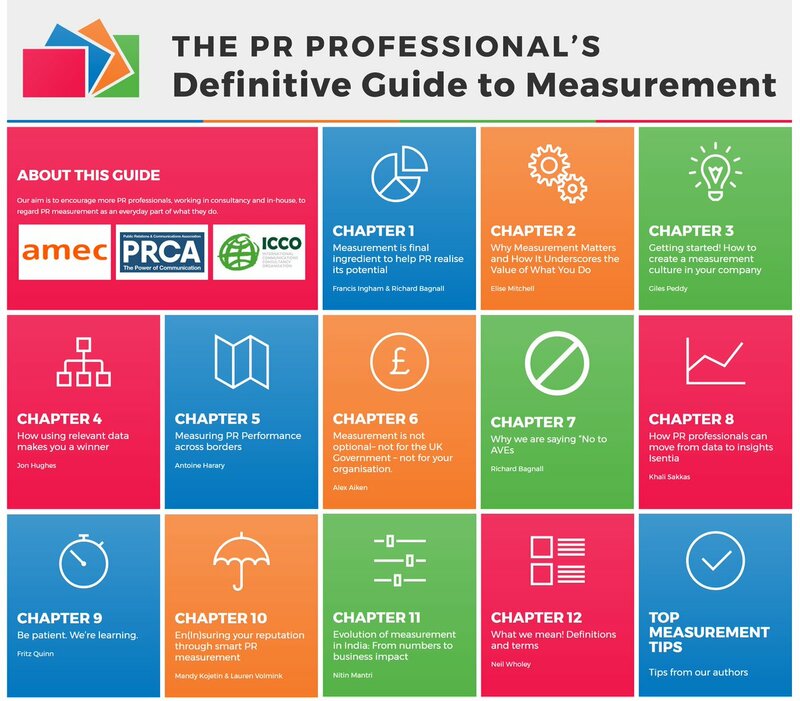 Packed full of tips, tricks and practical examples of measurement for the PR professional, AMEC’s PR Professional’s Definitive Guide to PR Measurement was launched during the month. The guide is sponsored by Hotwire, and produced in partnership with the PRCA, PRCA MENA and ICCO. It contains advice and guidance from a wide range of voices including ICCO President, Elise Mitchell, Golin’s John Hughes and Antoine Harary of Edelman Intelligence. In other news from AMEC, the group have launched the 2018 International Communications Effectiveness Awards. The romantics among you will appreciate the early bird closing date of 14 February. The UK’s PRCA has announced the launch of its Evaluation Group. The group “will provide a forum to discuss the importance and future of measurement and evaluation in the PR and communications industry”. The group is chaired by Emma Hopkinson CMPRCA, from Kantar Media. The Group’s Vice-Chairmen are Gaelle Bertrand MPRCA, also from Kantar Media, and Hotwire’s Andy West CMPRCA. Members of the PRCA can learn more and get involved. The FIBEP World Congress was held over three days in October. The Congress covered a range of topics from Newsmeter’s take on fake news to Universal’s launch of Alpha Clips. The trade group also announced a new President – Johna Burke, CMO of BurellesLuce will takeover from Alexis Donot.